It’s rare that a young child figures out her desire and path in life and actually sticks with it through adulthood, but Melanie Hall knew what she wanted to be before she hit 10 years old. “I remember being in fifth grade and already thinking that I was going to major in musical theatre,” says the girl claiming to be the quintessential nerdy but happy kid. “I got along with everybody and had a lot of friends but I was kind of geeky. I was a music theatre geek,” Melanie laughs. Melanie grew up in Lincoln, Neb. “A very wholesome place, not terribly exciting, but it’s friendly and safe and all those things you want when you have a family to raise,” she says. Both her parents were, and still are, musicians, theatrically involved, and a main source of encouragement for her in pursuing the arts. They started her early with piano lessons and by 15 she was taking private voice lessons, having already sung in choirs. Melanie graduated from high school in 1998, and, as she puts it, got out of there pretty quickly, enrolling at Illinois Wesleyan as a music theatre major. “I did my share of collegiate partying and got my ya-yas out.” Melanie made it through, graduating in 2002. “My plan was to perform, and I did. Right out of college my first job was doing summer stock theatre in Door County, Wisconsin.” The play was I Do! I Do! also known in its movie version of Four Poster Bed. It was her first experience as an actor with a steady job in the arts and she was hooked. After summer stock, Melanie jumped into the regional theatre acting life touring with different shows, a few various productions of Dickens’ Christmas Carol because, she said, it was a popular thing to do for the holiday season and she ended up on that stage more than once. In 2003, following the limelight and call heeded by many actors, Melanie moved to New York City for the first time. “That was what you were supposed to do,” she concedes. “You’re an actor, you move to NYC. It’s the rite of passage, it’s the Mecca.” Melanie pounded the pavement to all the auditions and did a couple of shows. “I was doing shows, working odd jobs, working at a juice bar and a fat-free ice cream shop,” the classic starving artist in the Big Apple. But even so, she loved it and the city that never sleeps nourishes the creative soul. “I was having a great time. I would be in rehearsal until 1 a.m., then take the train home, get up at 6 a.m. to get to the juice bar and then do it all over again. I got free juice out of it, which kept me going.” Living on pure adrenalin and the hope of the next audition back in those days, she laughs that she could never pull off that lifestyle now. 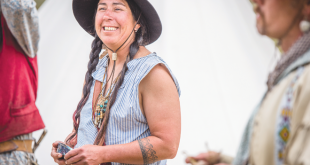 Melanie decided to take a break from the concrete jungle in the summer of 2003 to take a job just outside of Yellowstone, one of the places her family used to go when she was a kid. She worked at the same restaurant that her aunt and uncle worked at 20 years prior, and the family had remained friends with the owners. “After being in the urban jungle I was craving some mountain time. It was a pivotal point,” she felt, and it fed into her mountain addiction. Melanie laughs that she obviously didn’t grow up with that since she lived in Nebraska. “As a kid we came to Colorado a lot to just hang out,” she says. Shortly after she took the job at Yellowstone, her parents bolted from the northern flatlands, relocating to Estes Park, Colo.
Melanie next spent a year in Charleston, S.C., with another theatre internship, primarily acting in some great roles, but also teaching theatre classes to kids. After this, she said, everything changed. “I went to Alaska that summer in 2005. I never expected a theatre job to take me to Denali National Park. 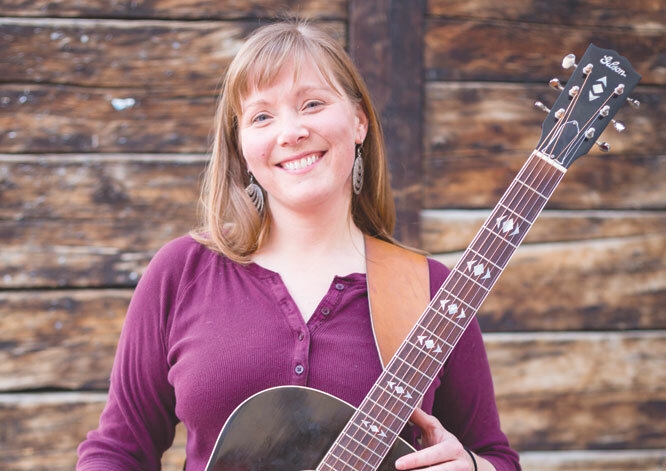 It seemed like the perfect thing for me since it was a way to combine theatre and the mountains.” Melanie was singing, acting and dancing her way through waiting tables at the Princess Lodge, in The Music of Denali, a dinner theatre. The venue was part of the Princess Cruises and passengers would get off the ship and hop a train for the eight-hour ride to the lodge and show, touring the area as well. Melanie later switched to a neighboring dinner theatre where the shows were also original and told the history of Alaska and its Gold Rush days. “All of those things that go on up there. Frontier life,” Melanie says of the storyline. “This is my 12th summer doing it. I got hooked.” In the winters, she’d leave Alaska and hop around for a little while, returning to do some shows in NYC. During one of her summer stints in Alaska, Melanie found her now fiancé, Kevin Kimura. It was 2011 and they were both playing in different bands for the same events. Her band was Sweet Ginger Heat, a country meets folksy bluegrass genre. The two play together in their country honky-tonk band, and Melanie plays solo as well. But it was another musician playing in an Alaskan band, Denali Cooks, who Melanie blames for the start of her love affair with Crested Butte. 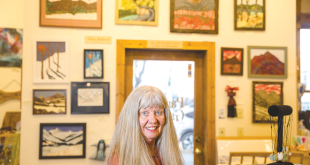 “I have Jimmy Sandy to thank, or blame, about winding up in Crested Butte,” she smiles. “He was responsible for my first visit here back in 2009.” She had won a ski trip to Crested Butte, which Jimmy had gotten donated to a charity auction in Alaska. Jimmy set her up with a couple of gigs at the Princess Wine Bar and also at 9380. And three years ago, Melanie and Kevin decided to make it their yearly winter home. Melanie landed a job as a Mountain Express bus driver before she even found a place to live. 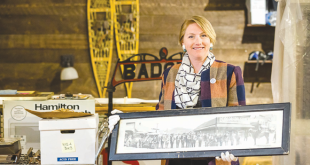 Being a shuttle driver afforded her the opportunity to change jobs in Alaska as well since she now had the commercial driver’s license she needed to drive the Denali tour buses. “I loved being in Denali but I wanted the opportunity to spend more time in the park and not just at the entrance area where the dinner theatre takes place. Kevin was a tour bus driver up there and they all seemed to really love their job. It was just the job I was looking for in the place I was trying to be,” although she admits that the Denali Park roads are pretty scary. 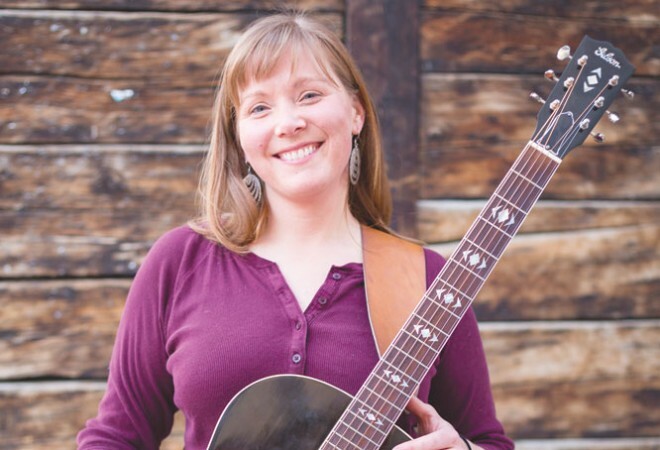 You can catch Melanie’s sweet vocals and guitar at The Princess Wine Bar on Mondays and at the Coal Creek Grill every Saturday, at least until the lifts here grind to a stop and she heads back to Alaska.